In recent decades, Beijing, the capital city of China, has experienced increasingly frequent persistent haze events (PHEs). Severe PHEs not only lead to a sharp decrease in visibility, causing traffic hazards and economic disruptions, but also induce serious health problems such as respiratory illnesses and heart disease. While the increased pollutant emissions are the biggest contributor, changes in regional atmospheric circulation associated with large-scale climate warming are found to play a role, as well. 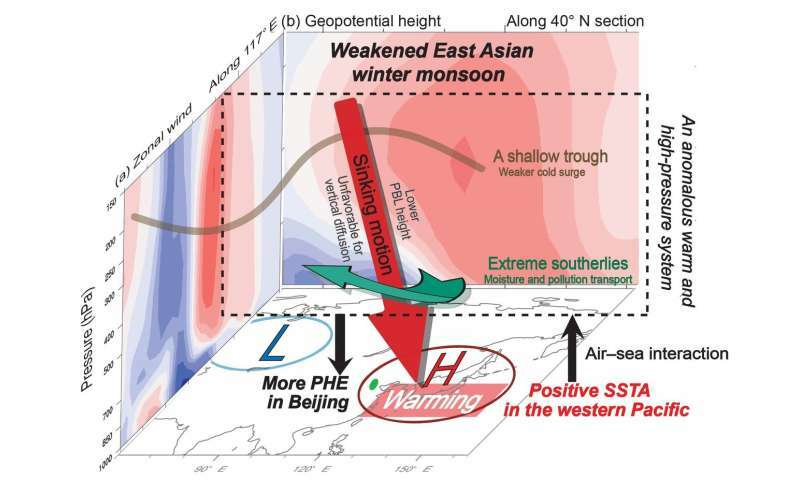 A recent study published in Atmospheric Chemistry & Physics by Dr. PEI Lin at the Beijing Urban Meteorological Institute and Prof. YAN Zhongwei at the Institute of Atmospheric Physics Chinese Academy of Sciences and their colleagues demonstrated a significant positive trend of PHEs in Beijing for the winters from 1980 to 2016, and its close relationship to an increasing frequency of extreme anomalous southerly episodes in North China, as a result of a weakened East Asian winter monsoon (EAWM) system. They further pointed out that over the period 1900-2016, the EAWM index was significantly correlated with the sea surface temperature anomalies (SSTA) over the northwestern Pacific, which exhibited a wavy positive trend, with an enhanced positive phase since the mid-1980s. Where does heavy air pollution in Beijing originate?